The military in China say a former top military official, Guo Boxiong, has confessed to taking "huge bribes" in return for promotions. 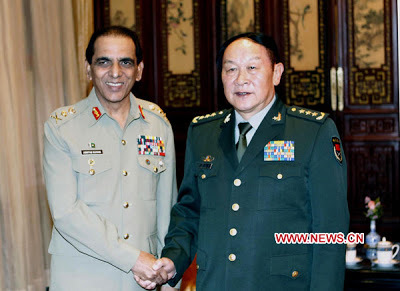 Gen Guo, 74, stepped down as vice-chairman of the Central Military Commission in 2012. The government began investigating him last July. He has now been handed over to prosecutors, the military said. President Xi Jinping has led a major anti-corruption campaign since taking office three years ago. Dozens of high level officials have been jailed as part of the drive. However, some observers see the campaign as a way for the Communist Party to rein in officials seen as becoming too influential, and say it could be used in political infighting. Gen Guo was found to have taken bribes worth $12.3m (£8.6m) but that is thought to be a small fraction of the wealth he actually amassed, sources told the South China Morning Post. China's Central Military Commission is in charge of the People's Liberation Army, the world's biggest armed forces with about 2.3m servicemen and women. Gen Guo joined the army in 1961 and in 2006 visited the US, where he met the then US Defence Secretary, Donald Rumsfeld. His case follows that of Xu Caihou, who was also a Central Military Commission vice-chairman at the same time as Gen Guo, and died of bladder cancer in March of last year. In 2014, the government said Xu had also confessed to taking bribes in exchange for helping in promotions. State media reported that it had taken a week to catalogue all the cash, jewels and antiques amassed in Xu's Beijing residence, and that 12 trucks had been required to remove them all. The pair served together under President Xi's predecessor, Hu Jintao. Mr Xi was also a vice-chairman with Gen Guo and Xu from 2010 to 2012, before he became head of the Communist Party and military commission chief. Gen Guo's son Guo Zhenggang, who is a major-general, was put under investigation in March of last year. Serving and retired Chinese military officers have said corruption in the armed forces is so pervasive that it could undermine China's ability to fight a war, Reuters reports.